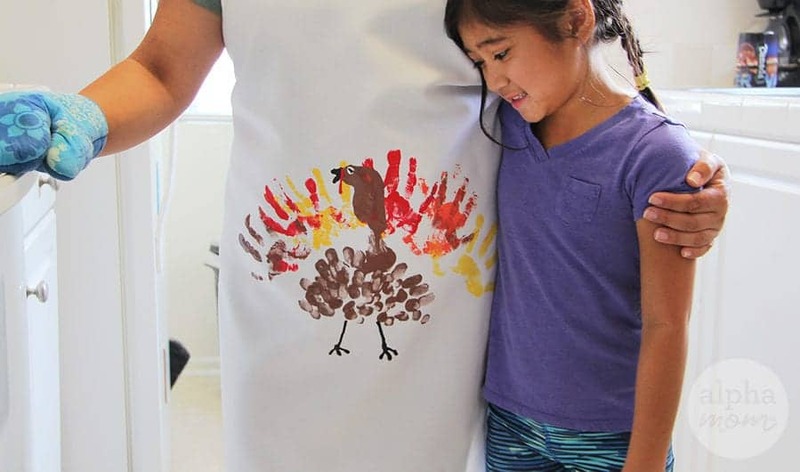 We’ve always thought it made a lot of sense to decorate an apron with fingerprints. I mean, why not? It’s going to end up with handprints and stains from the kitchen anyway. Why not start out with some on purpose!?! 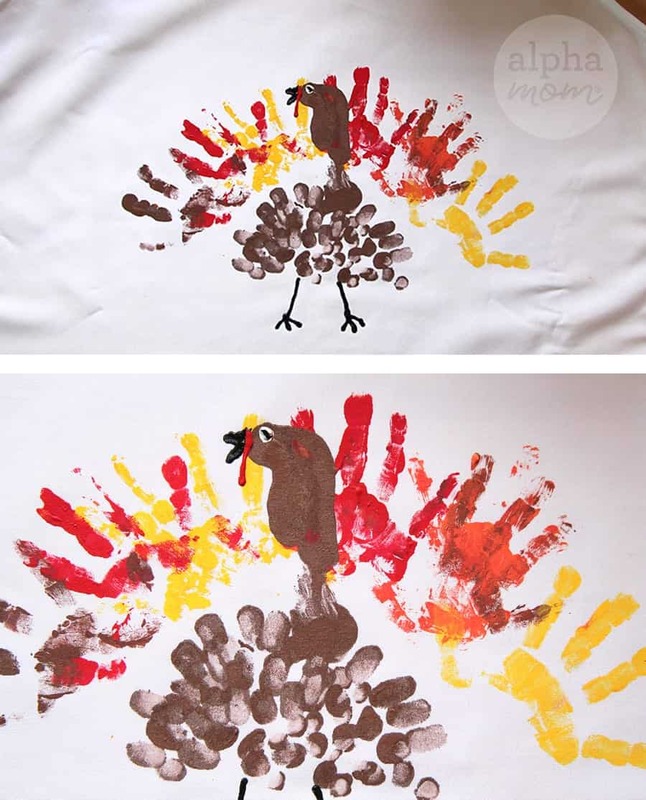 Here we make a handprint and thumbprint turkey using fabric paint. It’s super fun and festive, and would make a great gift for someone spending a lot of time in the kitchen during Thanksgiving. Step 1: First, lay out your apron on a flat surface. Make sure it is clean and ironed. Also make sure you have something underneath the apron like butcher paper or a plastic table cloth that you don’t care about in case the paint goes through. Note: fabric paint is easy to clean up but if it sticks and dries to fabric it sticks forever! So make sure your little ones are wearing clothes you don’t mind ruining if you don’t get them in the wash right away. Step 2: Next mix your paints and make sure you have a good amount of all the colors you will need on a plate that you can dip into with a paint brush or thumb. Squirt out a medium amount for red, yellow and orange. This will be for the feathers. Squirt out a medium amount of brown. This will be for the body. 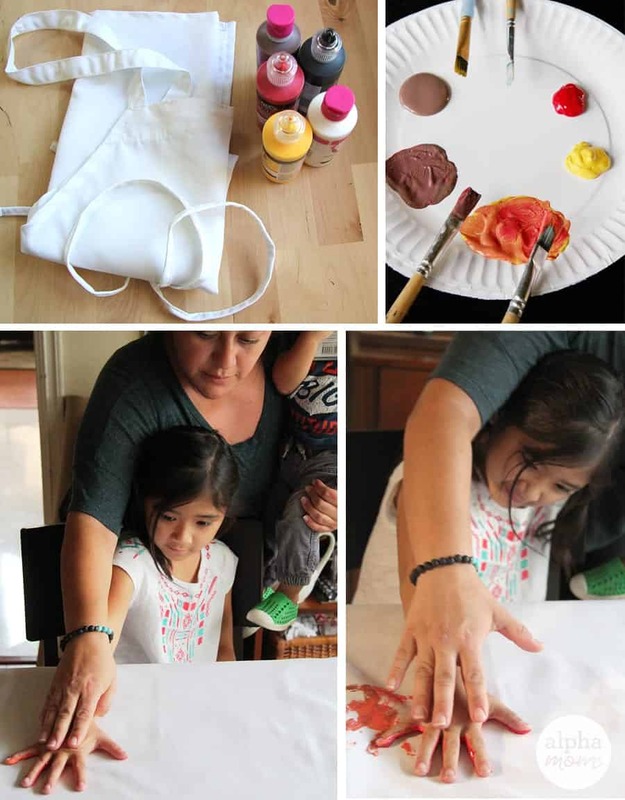 For the face detail you will only need a tiny bit of white, black and red and if your fabric paint has a nozzle on it you can apply it straight from the bottle like puffy paint. Step 3: Now you are ready to hand paint! 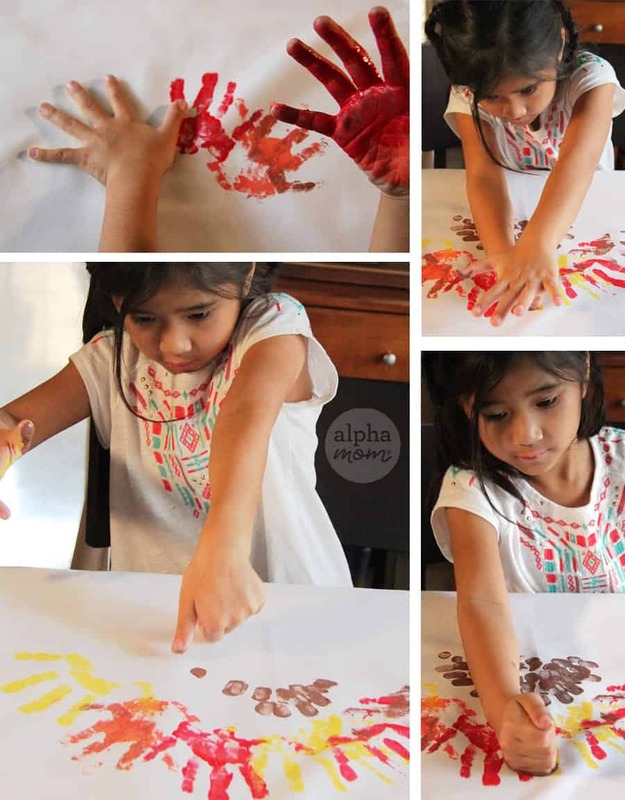 Paint your little one’s hand with a paint brush with your first feather color. This will tickle a little bit but it’s part of the fun. Then carefully stamp their wet, painted hand onto the apron to one side, fingers facing up. You are going to make an arc with their hands in different colors to create a splayed rainbow shape. This will be the feathers of the turkey. Repeat this stamping in different colors (washing in between colors and alternating hands) until you have a complete half circle. Then wash again and thumb print another half circle of brown thumbprints below the rainbow of colorful feathers. This will be the turkey’s body. When the body and feathers are complete paint your child’s whole fore arm and side of their fist with brown paint. This will be intensely ticklish for some but also super fun. Then stamp their whole arm and fist down into the middle of the rainbow and body of feathers with the fist towards the top. This is the turkey’s neck and head! Like so! (See below) It won’t look like much at first but after you add the detail (black or orange beak, red snood and a white circle with a black dot in the middle for an eye and then black or orange lines for feet) you will see it! 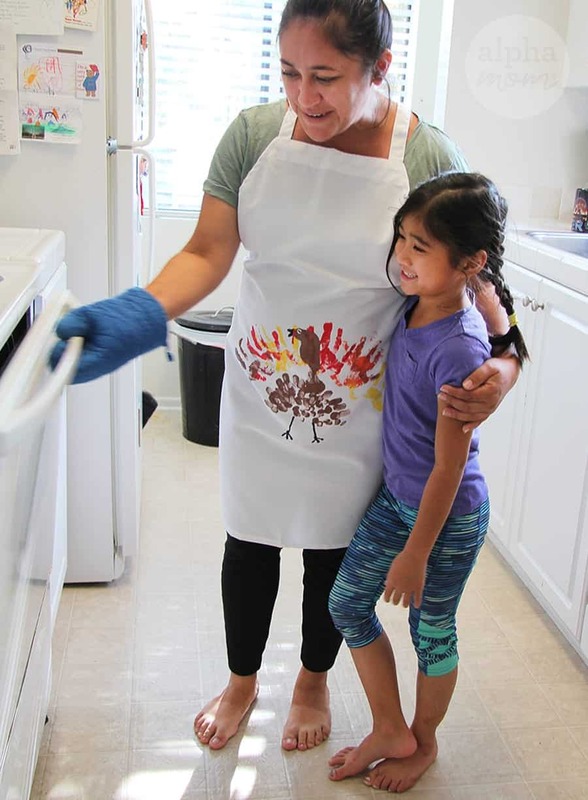 The best part is everything is made from fingerprint and handprints (little now but not for long) that the apron-wearer will cherish forever.